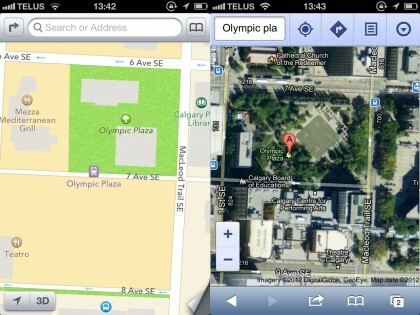 Except the 3D Maps on iOS 6, everything is working well. Indeed we have noticed a tremendous rise in the adoption of iOS 6 over the recent iOS updates, and got official words from Apple that more than 100 million devices are now updated to iOS 6 within just matter of 4 days. However, if you are still looking for the Google Maps return on the iOS 6+ running devices as an application, then let me tell you that will be pretty impossible at the moment. According to the words of Executive Chairman Eric Schmidt, Google is daily having talk sessions with Apple over the addition of Google Maps app in the App Store for the iOS 6 devices, but they are not yet to decide the approval. Schmidt said Google & Apple often talks “at all kind of levels”, and “We have not done anything yet”. The comment from Schmidt clearly shows that Google is trying to enter in the iOS devices world, but Apple is bit rude and not interested to get them in the iOS. Google is appearing to be in talks with Apple over the presence of Google Search by default in the iOS Safari web, and said in an event that Google wants them as a partner, but now it is up to them to take their proposal or not for the integration of Google Services into the iOS.